Sometimes when you’re out photographing you see cool photo opportunities. But then, there are these moments of perfection that something pops into your vision and says “that means something”. When I shot this photo in the village of Akwidaa in southwestern Ghana that’s exactly what I thought. 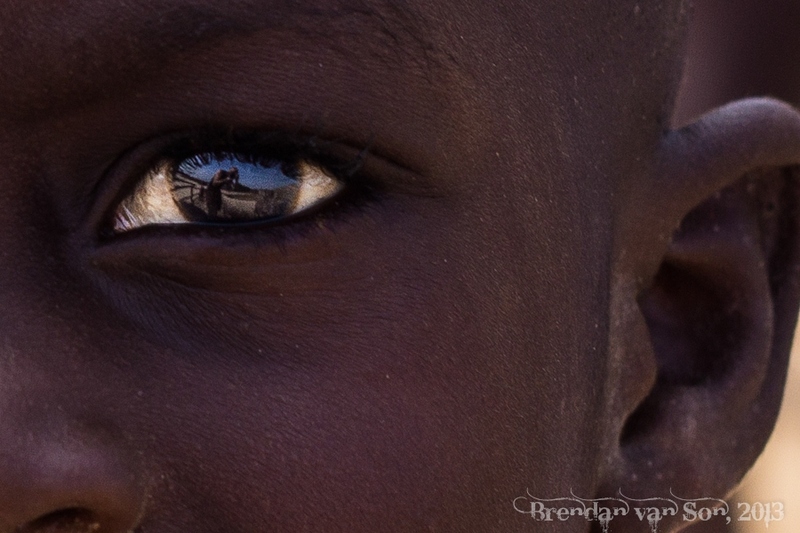 This kid had such brilliant eyes that they were reflecting me back. Unlike the other kids around he wasn’t so anxious to see the photos that he could hardly keep his pose. He had a deeper, more powerful look in his eyes as if he was judging me so strongly. I captured this photo, showed it to him, then he looked up at me and smirked unimpressed. He then walked off as the swarm of other kids around continued to scream, push and beg for photos to be taken of them. I kind of described how the shot came about in the intro so I’ll talk a little bit about the composition. Basically, well I’ve always been fairly strong with the technical side of photography, the art is where I really need to work. I tend to focus too widely on subjects rather than pick out certain elements. Thus, I took this photo as a challenge to myself. I wanted to build a composition that was more powerful than just a simple profile. Now, this image when I shot it was much wider than it is now. I cropped down about 40% of the image because on the fly it’s hard to get a composition so perfect. In regards to that composition, you can see I used the rule of two-thirds for the eye. I also made sure to crop out any other distracting images so that immediately draws the focus of the viewer and nothing takes their attention away from it. This is one of my favourite shots of the year so far, so here’s hoping for plenty more like it! Incredible photo. Really beautiful! Did you know you were going to be reflected in his eye or was it just luck? This blows my mind. What an amazing shot! A beautiful shot. It was lucky you came across a subject willing to stay still. A reflection in an eye – amazing.